I was so honored to be a part of eighteen25’s Spooktacular September event last week! 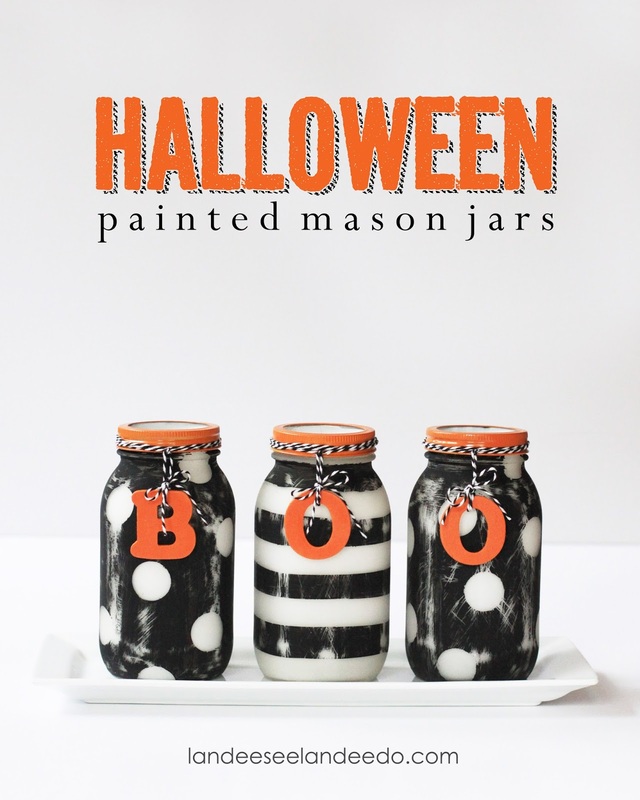 Today I am sharing the painted mason jars I created for the event here on my own blog. Before I get started, I want to tell you how much I love and adore the eighteen25 girls. You might see them just as the creative geniuses that they are on their blog but what you may not see is how kind and generous they are and how much they support and promote other blogs. They are constantly using their online presence to build others up in the blogging community and it warms my heart each time I see it. They are also extremely humble and are going to be so embarrassed that I am saying this but it had to be done. Love you Jen, Jamie and Jodie!! Now, onto my Spooktacular Halloween project! First, pour some slightly watered down white acrylic craft paint into jar and swirl around until inside is completely coated. Put upside down on parchment or wax paper to dry. I like to prop mine up on bamboo skewers and wipe the rim every once in a while with a paper towel until it stops dripping. Allow to dry upside down overnight. Next comes the fun part…decoratively painting the outside of the jar! For the polka dots I wanted big 1″ dots. I didn’t have any 1″ round stickers so I figured I’d make them myself. A) Overlap two long strips of painters tape on parchment/wax paper. Using a 1″ circle punch, punch out several circles. 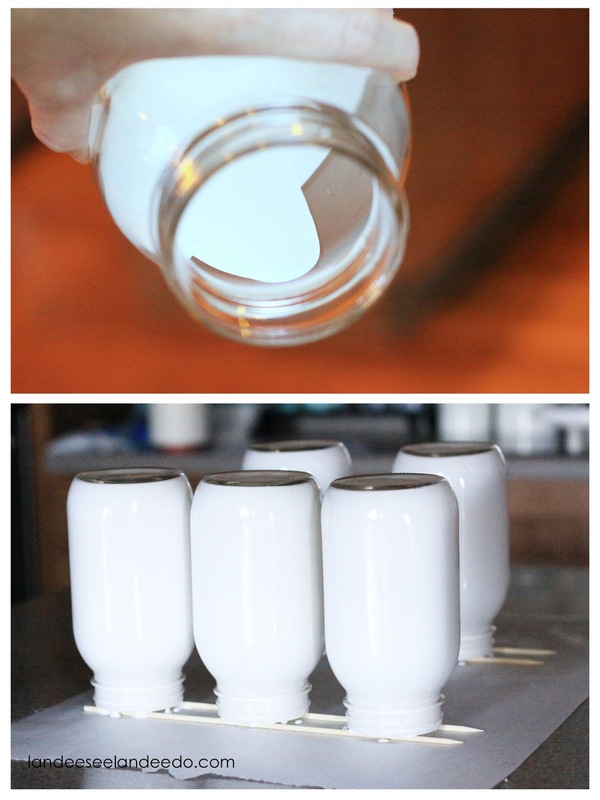 B) Peel parchment/wax paper off back of painters tape circles and apply to jar as desired. C) Paint over entire outside of jar with black acrylic craft paint (I did two coats). D) Peel off stickers! The paint had leaked under in a couple of little spots but I just used my fingernail to scrape the paint off. I think they are totally adorable as is, but I decided to “halloween them up” a little by distressing them with sandpaper. It just gave them a little bit of a spookier feel and some fun detail. 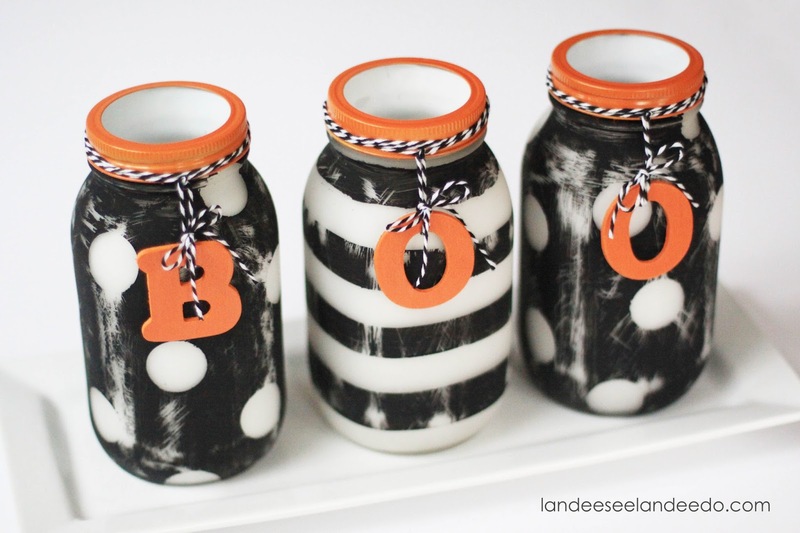 I made the striped jars in much the same way as the polka dot jars except I wrapped the painters tape around each jar evenly to create the stripes before painting over the entire thing with black paint. After I got them distressed just how I liked them, I sprayed the jars with a matte finish clear spray paint to keep the paint from coming off. 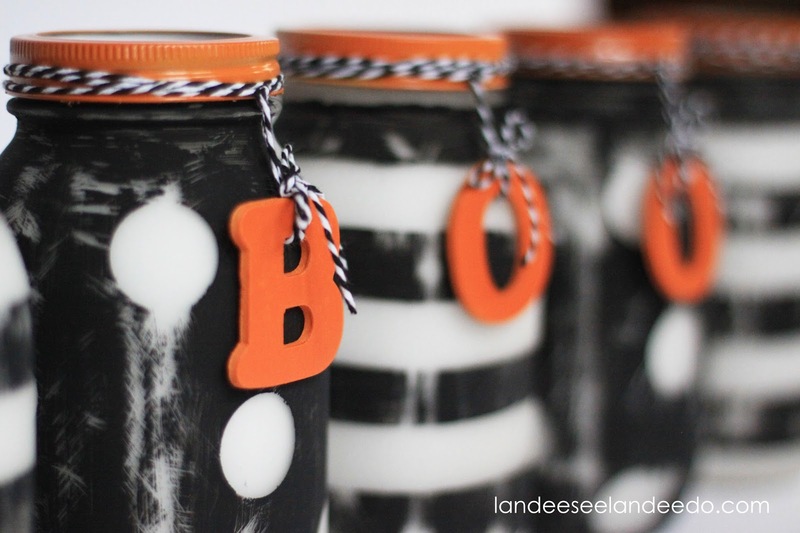 I also spray painted the jar lid rings and some wooden letters spelling out “BOO” orange and tied them to the jars with some black & white baker’s twine! I am planning on using them down the middle of my kitchen table as my centerpiece this Halloween season! Thanks for stopping by! Happy Halloween crafting! Too stinkin’ cute!!! Just pinned to my Halloween board. I’m doing a bee themed baby shower and I think with some addition of yellow these will be perfect! 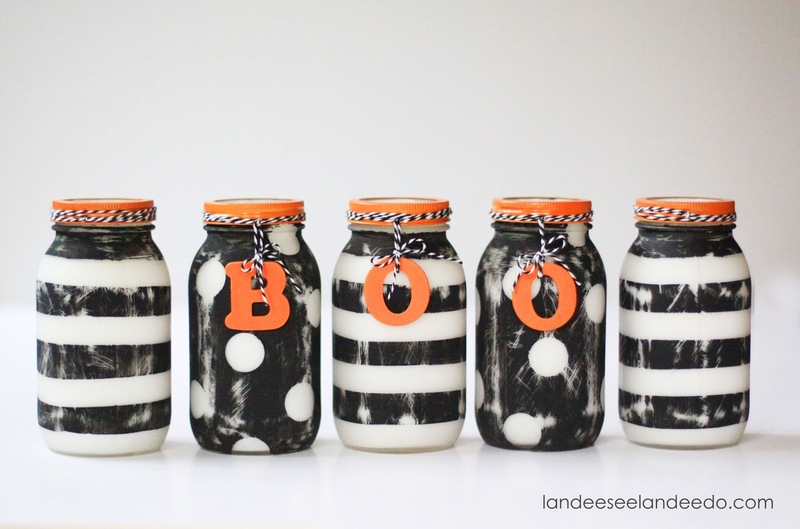 Love these jars! So cute for halloween! Fabulous! Love your work and your creative spirit.Great for adding a personal touch to these cute mason jars .Perfect for holiday/seasonal decor,I really would like to do this for my daughter room; thanks for sharing! Hi Cheri! I just used regular acrylic craft paint. It comes off of glass very easily, however, so when I had them distressed the way I liked them I sprayed them with a protective clear spray paint.